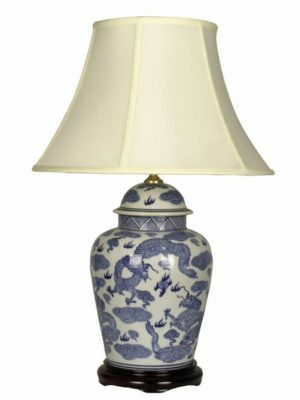 Red Chinese Porcelain Vase Lamp in a Lovely Blossom Theme. 43cm (17 inch) wide shade. Overall height is 71cm. All sizes are approximate. Please purchase and add a note at checkout letting us know if you prefer the dark or pale shades (or just email us!). 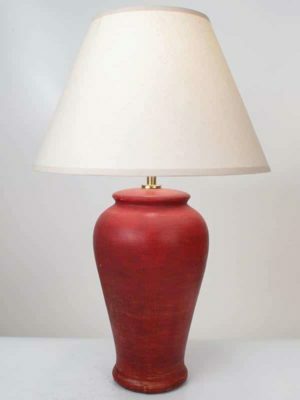 Red Chinese Porcelain Vase Lamp. Price inclusive of shades as shown and UK delivery within 2-3 days. A “supersize” image is available for this item. Please use the contact button to request one. The base is crafted from high quality porcelain and sits on a real wood attached stand. We offer a money back guarantee if you are not delighted with your purchase. Please note that due to their handcrafted nature some minor variations may occur between lamps. We do not supply bulbs due to possible filament damage during transit. 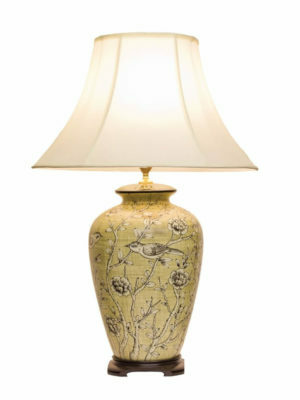 Vase Lamp decorated with hand-painted jasmine blossom on gnarly mature tree branches against a rich red speckled background. 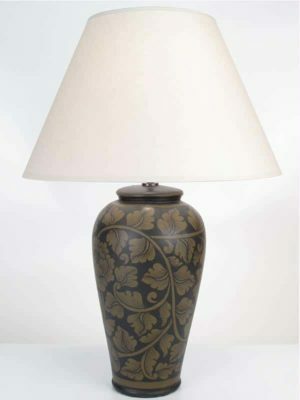 Constructed from a 35cm tall porcelain vase mounted to a square hardwood base and carrying a choice of a dark chocolate brown or a pale silver/gold lined faux silk shade. Lamps are packed in pairs for safe transport. Minimum order is therefore 2.